Admit it - when we were kids, we believed some pretty insane stuff. "OH, a tiny fairy comes in my room at night and gives me cash in exchange for my teeth? Of course she does!" But you know what, parents? Some things never change, because our kids believe ALL THE SAME STUFF. And of course, we wouldn't have it any other way. 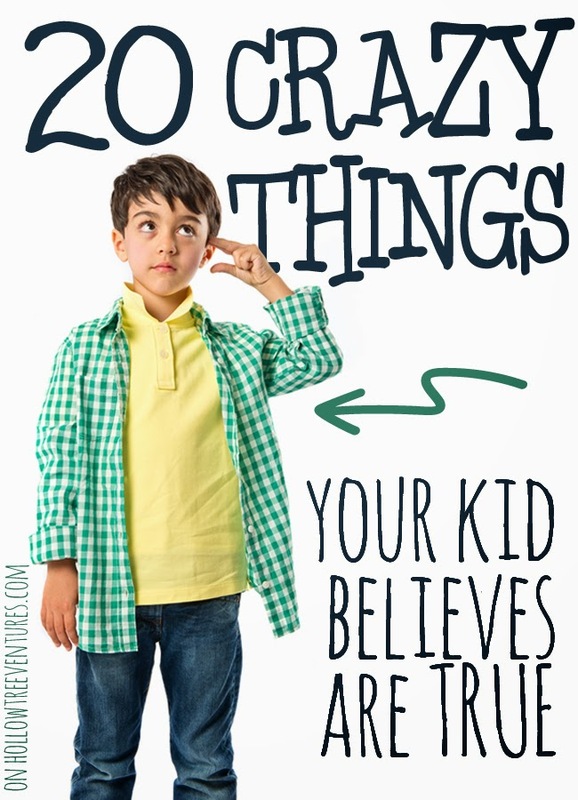 Here's just a small sampling of the things we used to believe were true - and according to our children, still are. Root beer is really beer. Staying up past midnight is awesome. Watermelon seeds grow watermelons in your stomach. All moms are named Mom. You can literally break your mom's back by stepping on a crack. Book characters can escape from the pages at night. ...which come directly out of Mom's stomach when they're born. Stuffed animals come alive when you're not looking. When your parents drive at night, the moon follows you home. Blankets protect you from monsters. You can actually catch cooties. Chimneys are where clouds are born. You can make a color photo by taking a new picture of a black and white one. Being a grown-up is fun. Oh, #20 is just so sad. So, 'fess up - what crazy things did YOU used to believe? Labels: children, humor, List Lover, What did you say?